Elevate Fitness is a space for you to nurture mind and body. 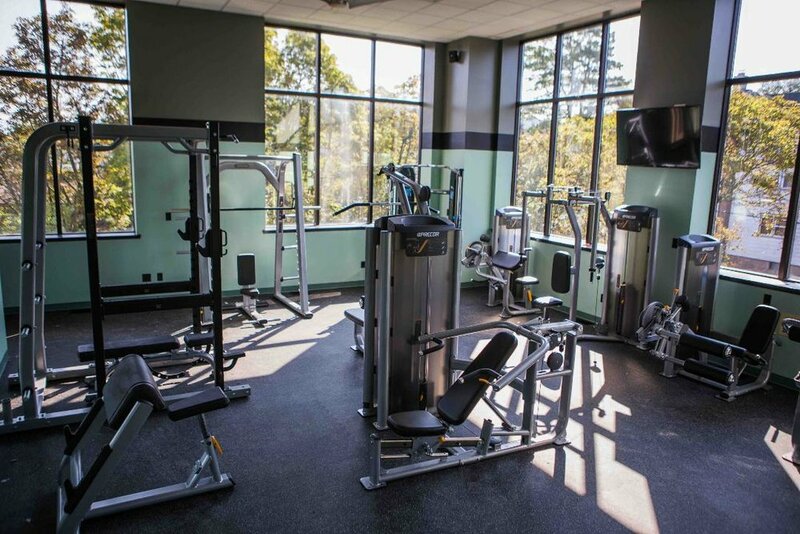 The design and flow of the Fitness center allows you to engage in activities in a convenient and comfortable way. The Precor equipment featured in the center includes state-of-the-art cardio, resistance, and spin machines. If you are looking to get fit, tone down, or bulk up, we have the equipment for you. You can also request personal training services for a more in-depth approach to your fitness needs. Our friendly staff is available to assist with equipment orientation, safety, healthy approaches to training, and fun. The center also includes a dedicated Yoga studio and a massage therapy studio, operated by Interlude Massage. These offerings are excellent compliments to any workout regimen or as stand-alone benefits for your overall health and wellness. The yoga instructors and massage therapists are happy to explain what offering can most benefit you. We also have a float pod onsite. Also known as sensory deprivation tanks, a float pod simulates a zero gravity sensory free environment, allowing your mind and body to be removed from all stimulus and distractions. In this environment an opportunity is created to calm your body and mind, resulting in true rest and relaxation. You can click through our site or call us. However, we most enjoy when you stop in to learn about what we have going on here.